If you play Worldmatch slots at Intertops Poker or Juicy Stakes Casino without a win this weekend, you can ask for 35% of your last deposit back. This weekend, February 2 – 4, they're giving 35% Instant Cashback to anyone that busts a deposit playing any of their more than 130 slots from Worldmatch. 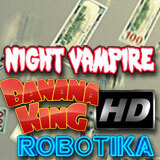 Three HD games by Worldmatch -- Banana King HD, Robotika HD and Night Vampire HD -- are bound to be favorites this weekend as they always are. However, if you play through your deposit playing ANY Worldmatch slot game without a win you can contact customer service (by Wednesday) and ask for cashback. 35% of your last deposit will be instantly credited to their account. Play-through on this bonus refund is just 10X. There is no max cashout. Poker rooms offer selection of slots from Worldmatch. You can request Cashback by e-mail or telephone but Live Chat is the easiest and quickest way to get their refund. Intertops Poker has a busy poker room with players of all skill levels from all over the world. They also have a big selection of slots and other casino games from Worldmatch, Betsoft and Lucktap. Fun-loving chimps rule the forest in Banana King HD. Night Vampire HD has Bonus Games where players guess the colour of the Prince of Darkness’ horses or shoot at bats to win instant bonus prizes. Inspired by sci-fi novels, Robotika HD has five Stacked Symbols to boost the chances of winning as well as a free spins feature. Further information is available at Intertops Poker at https://poker.intertops.eu/en/promo/181-35-cashback-on-worldmatch-slots and at Juicy Stakes at https://www.juicystakes.eu/promotions/cspromotions/35-cashback-weekends-on-slots.